by Donna Baltz, Waukesha, Wis.
Donna Baltz was originally planning to make a one-dimensional fretwork version of her photo of Cana Island Lighthouse in Door Country, Wis. However, she was experimenting with vector software and, with the help of a tutorial on the Scroll Saw Woodworking & Crafts forum, learned how to make a layered project. Said Donna, “I sketched out a simple pattern on the computer and went back to the saw. I was amazed with my first attempt, so with a little sanding, the lighthouse was complete.” The background and trees are fretwork carved with a Dremel. 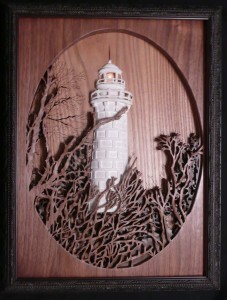 Donna made the frame and fretwork trees from black walnut and cut the lighthouse from balsa. The project is lit by a battery-operated Christmas light and is housed in a custom-made shadow box. This year, the editors noted a subtle theme woven among many of the entries: simplicity. It’s not that there weren’t impressively intricate entries; there were, and many of them are recognized as People’s Choice award winners. But we also saw artwork that was elegant in the artists’ restrained approach to design, materials, and finishes. We admired the clean lines and thoughtful details of these pieces, which also highlighted their flawless workmanship. Many hours in the shop have taught us that you have to work hard to make something look that easy. 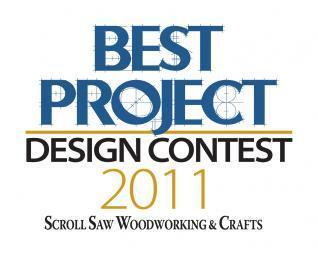 In the General category, we chose to award two woodworkers for their outstanding examples of beauty in simplicity. by Joseph Treadwell, Fontana, Calif.
We enjoyed the well-balanced, aesthetically pleasing design of Joseph’s trivets, as well as the sly two-for-one usefulness of the set. Joseph made the Trivet Set, 7″ by 7″, from one piece of bird’s eye maple, using one blade-entry hole. He designed the set to be used as one or two pieces, and stained the center piece for contrast. 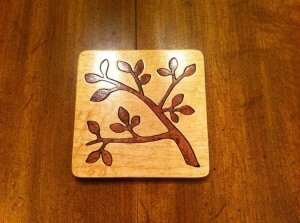 Joseph finished the trivets with spray gloss polyurethane. by Kip Travis, Southport, N.C. 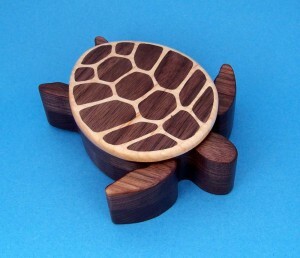 The design of Kip’s turtle is sleek and sparse, focusing on the beautiful wood and well-fitted inlay. We appreciate that this box is useful as well as decorative. Kip made the box from maple and walnut, and finished it with lacquer.